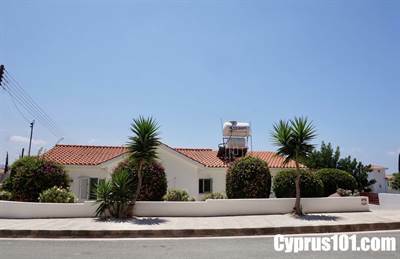 This beautiful Reduced Price Bungalow in Peyia has three bedroom, two bathroom and situated on a private corner plot in a quiet residential neighbourhood of Lower Peyia. Only a few minutes’ drive away is the popular holiday resort of Coral Bay, plus the many amenities Peyia has to offer including supermarkets, shops, bars, restaurants, gym and local medical centre. The property is very well maintained and being a permanent residence has many extras including coal effect fire for the cooler months, security alarm, pressurised water system, granite worktops, ceiling fans with lights and good quality shutters throughout. Solar panels situated on the roof are used to generate electricity, keeping running costs to a minimum. The accommodation features an open plan living room with comfortable lounge and dining area, separate well equipped kitchen, master bedroom with en-suite shower room, two further double size bedrooms and a family size bathroom. From the living room there is easy direct access to the perfectly manicured landscaped garden, crystal clear swimming pool and surrounding sunbathing terrace. A large variety of trees and shrubs offer wonderful privacy to the enclosed garden, as well as an abundance of colour and fragrance. Running the length of the property is a fabulous covered terrace with two seating areas overlooking the leisure space. Steps to the side lead up to an amazing roof terrace – a spectacular platform from where you can enjoy the stunning panoramic sea and mountain views plus the beautiful Paphos sunsets. Highly suitable as a permanent residence or holiday home, this property offers comfortable living with great privacy in a quiet popular neighbourhood. Being fully furnished, it’s ready to move in and has full title deeds.